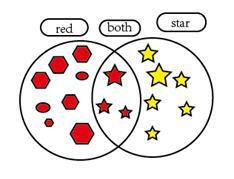 (1) How many are both red and stars? (2) How many are stars but not red? (3) How many are red but not stars? (4) How many are either red or stars but not both red and stars? (1) Count the symbols are both red and stars. Its 3. So the answer is 3. (2) Count the symbols that are stars but the color is not red. Its 6. So the answer is 6. (3) Count the symbols that are red but not stars. Its 8. So the answer is 8. (4) Count all the symbols. Its 17. Then subtract three red stars from 17. Its 17 - 3 = 14. So the answer is 14.